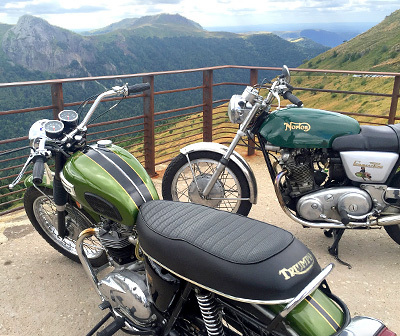 The picturesque winding roads of Auvergne have always attracted lovers of motorized tourism. Try out the historic coastal race of the Mont-Dore, visit the Basilica of Orcival and head to the Chaudefour Valley by beautifully picturesque winding roads. Bordered by the most distinctive D983 road, the Auberge du Lac de Guéry has always been a favorite stop for travelers. This is a regular venue for car or motorcycle rallies, including the Mont-Dore coastal race, which have established their base camp here to discover the Regional Natural Park of the Volcanoes of Auvergne or simply as one stage on their route. Being ourselves passionate collectors of motorcycles and vintage cars, we reserve you the warmest welcome!